Many major national and international corporations are now starting to recognize the importance of business fundraisers to support local community groups and global causes. As the phrase “corporate social responsibility” becomes a hot media topic, employee talent is starting to shine favor on companies who contribute to charity causes. Corporate and business fundraisers may be as simple as giving a cash donation to the owner’s chosen cause, or it may be done on a larger scale – encouraging staff to organize fundraising events and donate portions of their weekly paychecks to a charity effort. Many corporate entities will even match employee contributions to certain fundraising efforts. Smaller companies, even though many are startups not making a lot of revenue to begin with, can give in other ways. Just because they may not be able to give financially, they can still create volunteer opportunities for staff or even provide a type of pro bono service to community organizations. For instance, many yoga studios will offer community yoga where senior citizens or single mothers can come to practice yoga for free or for a small donation. Many companies report that workplace satisfaction is heightened when employees donate their time, talents, and earnings to make a difference in the lives of the less fortunate. Pulling together as an office to raise awareness and funds for a worthy cause also promotes good will and teamwork across the office or department. Many times, company fundraising efforts can improve the reputation of the business in the eyes of the community. Take for instance fundraising events that improve the community areas, such as park and road cleanup projects, building homes for the less fortunate, and those that help improve the lives of seniors, animals, and children. These outward displays show that the faceless corporate identity does have a heart. Giving to others can greatly improve employee morale by creating a bonding experience. 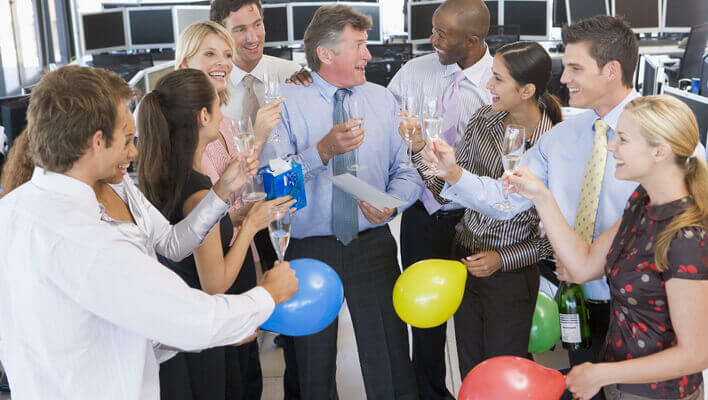 For instance, mini-fundraisers throughout the year can provide a series of fun events for all employees to attend together, and raise money for a good cause. Encourage employees to bring their lunch from home and donate what they would have spent on lunch to the charity of your choice. Alternatively, the office can provide free lunch and collect donations from employees towards the charity. Find a local florist willing to donate cut flowers every month. Sell raffle tickets and host a monthly draw. The winner gets to beautify their desk or take the flowers home to give as a gift to a loved one. Reserve a premium parking spot. Perhaps the CEO will part with his spot for a year and park somewhere else in the lot. Sell tickets to raffle the spot. Bring pizza and cans of pop in for lunch. Sell them in a package deal—$5 for a slice/bottle. You can do the same as above with coffee and donuts, bagels, or muffins in the morning. Rent a dunk tank and get the CEO or a popular manager to volunteer to sit in it. Let employees donate $1 to throw a ball and try to dunk them. Let people wear their casual clothes for $2. This is especially popular if uniforms are the business dress. Talk with Human Resources to see if they will be open to raffling off a paid holiday. Employee volunteers bring in baked goods and other employees pay to take a goodie back to their desk. Employees pay to enter a silly hat or shirt contest. During lunch hour, host a hat or shirt walk off and let employees vote for the most atrocious hat. The winner gets a prize. Erect a basketball hoop in a cleared and safe zone. Block off time in the workday for an elimination shooting match. Shooters make a donation to enter the match and the winner receives a prize. If you work in a predominantly male environment, guys will grow their mustaches over the period of two months. The whole office gets involved by betting on who will have the best mustache. This contest will create a good spirit of competition working up to judgment day. This is a fundraiser where willing volunteers have their heads shaved for donations. The money goes to a worthy charity. Those with lengthy locks can donate them to organizations that make wigs for cancer patients.